Modeling Zero-Inflation: Is It Better to Fish Poorly or Not to Have Fished at All? The following example shows how you can use PROC FMM to model data that contain more zero values than expected. Many count data show an excess of zeros relative to the frequency of zeros expected under a reference model. An excess of zeros leads to overdispersion because the process is more variable than a standard count data model. Different mechanisms can lead to excess zeros. For example, suppose that the data are generated from two processes with different distribution functions—one process generates the zero counts, and the other process generates nonzero counts. In the vernacular of Cameron and Trivedi (1998), such a model is called a hurdle model. With a certain probability—the probability of a nonzero count—a hurdle is crossed, and events are being generated. Hurdle models are useful, for example, to model the number of doctor visits per year. Once the decision to see a doctor has been made—the hurdle has been overcome—a certain number of visits follow. where is a standard count model with mean and support . At first glance, the prevalence of zeros in the DATA set is apparent. Many park attendees did not catch any fish. These zero counts are made up of two populations: attendees who do not fish and attendees who fish poorly. A zero-inflation mechanism thus appears reasonable for this application because a zero count can be produced by two separate distributions. The following statements fit a standard Poisson regression model to these data. 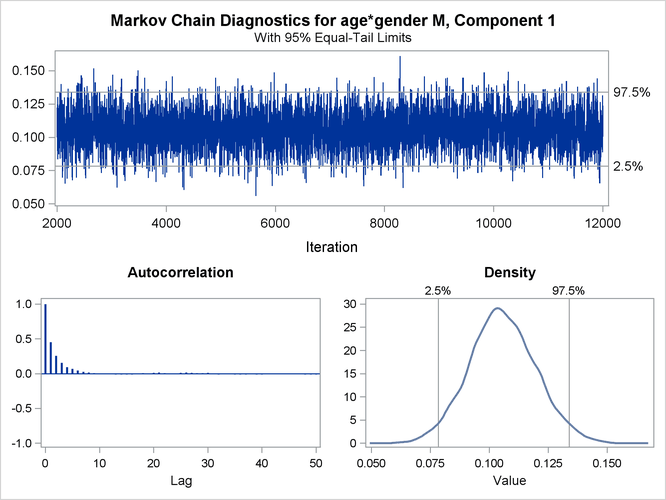 A common intercept is assumed for men and women, and the regression slope varies with gender. Figure 39.7 displays information about the model and data set. The "Model Information" table conveys that the model is a single-component Poisson model (a Poisson GLM) and that parameters are estimated by maximum likelihood. There are two levels in the CLASS variable gender, with females preceding males. The "Fit Statistics" and "Parameter Estimates" tables from the maximum likelihood estimation of the Poisson GLM are shown in Figure 39.8. If the model is not overdispersed, the Pearson statistic should roughly equal the number of observations in the data set minus the number of parameters. With n=52, there is evidence of overdispersion in these data. Suppose that the cause of overdispersion is zero-inflation of the count data. The following statements fit a zero-inflated Poisson model. There are two MODEL statements, one for each component of the mixture. Because the distributions are different for the components, you cannot specify the mixture model with a single MODEL statement. The first MODEL statement identifies the response variable for the model (count) and defines a Poisson model with intercept and gender-specific slopes. The second MODEL statement uses the continuation operator ("+") and adds a model with a degenerate distribution by using DIST= CONSTANT. Because the mass of the constant is placed by default at zero, the second MODEL statement adds a zero-inflation component to the model. It is sufficient to specify the response variable in one of the MODEL statements; you use the "=" sign in that statement to separate the response variable from the model effects. Figure 39.9 displays the "Model Information" and "Optimization Information" tables for this run of the FMM procedure. The model is now identified as a zero-inflated Poisson (ZIP) model with two components, and the parameters continue to be estimated by maximum likelihood. The "Optimization Information" table shows that there are four parameters in the optimization (compared to three parameters in the Poisson GLM model). The four parameters correspond to three parameters in the mean function (intercept and two gender-specific slopes) and the mixing probability. Results from fitting the ZIP model by maximum likelihood are shown in Figure 39.10. The –2 log likelihood and the information criteria suggest a much-improved fit over the single-component Poisson model (compare Figure 39.10 to Figure 39.8). The Pearson statistic is reduced by factor 2 compared to the Poisson model and suggests a better fit than the standard Poisson model. The number of effective parameters and components shown in Figure 39.8 equals the values from Figure 39.9. This is not always the case because components can collapse (for example, when the mixing probability approaches zero or when two components have identical parameter estimates). In this example, both components and all four parameters are identifiable. The Poisson regression and the zero process mix, with a probability of approximately 0.6972 attributed to the Poisson component. 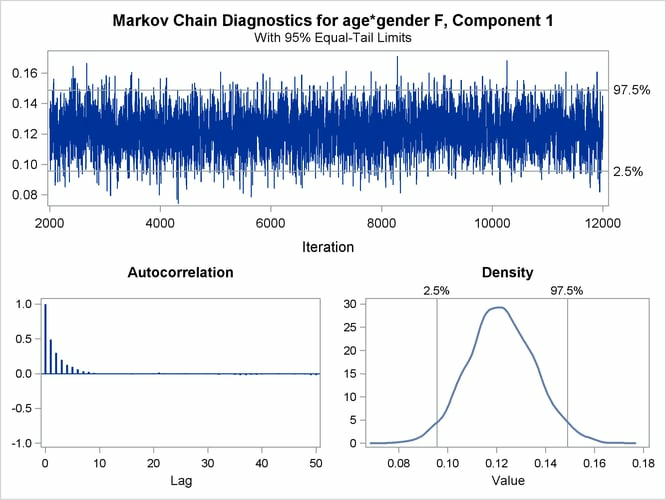 The "Model Information" table indicates that the model parameters are estimated by Markov chain Monte Carlo techniques, and it displays the random number seed (Figure 39.11). This is useful if you did not specify a seed to identify the seed value that reproduces the current analysis. The "Bayes Information" table provides basic information about the Monte Carlo sampling scheme. The sampling method uses a data augmentation scheme to impute component membership and then the Gamerman (1997) algorithm to sample the component-specific parameters. The 2,000 burn-in samples are followed by 10,000 Monte Carlo samples without thinning. The "Prior Distributions" table identifies the prior distributions, their parameters for the sampled quantities, and their initial values. The prior distribution of parameters associated with model effects is a normal distribution with mean 0 and variance 1,000. The prior distribution for the mixing probability is a Dirichlet(1,1), which is identical to a uniform distribution (Figure 39.11). Because the second mixture component is a degeneracy at zero with no associated parameters, it does not appear in the "Prior Distributions" table in Figure 39.11. Figure 39.12 displays descriptive statistics about the 10,000 posterior samples. Recall from Figure 39.10 that the maximum likelihood estimates were –3.5215, 0.1216, 0.1056, and 0.6972, respectively. With this choice of prior, the means of the posterior samples are generally close to the MLEs in this example. The "Posterior Intervals" table displays 95% intervals of equal-tail probability and 95% intervals of highest posterior density (HPD) intervals. A separate trace panel is produced for each sampled parameter, and the panels for the gender-specific slopes are shown in Figure 39.13. There is good mixing in the chains: the modest autocorrelation that diminishes after about 10 successive samples. By default, the FMM procedure transfers the credible intervals for each parameter from the "Posterior Intervals" table to the trace plot and the density plot in the trace panel.